Welcome to the unit that will teach you all about how this great nation became great! In this unit you will learn about how the Founding Fathers and early Americans formed a new nation. 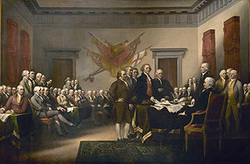 Through a rocky start and many disagreements, they came up with the first government formed without war and tyranny. It was formed by compromise, diligence, and well thought out plans. The United States Constitution is the most important document in American history, and is still what governs all of us today.